If you are on the verge of opening a new frozen yogurt shop, or if you already own and/or operate a frozen yogurt store, you may want to consider launching a frozen yogurt loyalty program – if you haven’t already done so. A frozen yogurt loyalty program can be highly successful and can keep customers coming back for soft serve from your frozen yogurt machines time and time again. So many food establishments offer loyalty programs that customers have come to expect them. If a frozen yogurt shop does not offer a loyalty program, customers might actually wonder why! Everyone loves to get something as a reward for being dedicated. It’s almost entertaining for people to look in their own wallet to discover how many loyalty cards are inside – and how many more visits are required in order to earn a free sandwich, a free drink, or a free cup of froyo that comes directly from a soft serve frozen yogurt machine. It’s no secret that soft serve ice cream machines are available at many restaurants and convenience stores. Why should a customer choose your establishment over any other? In Addition to the fact that your customers may thoroughly enjoy the frozen yogurt that is self-dispensed from your shop’s frozen yogurt machine, your customers may like the loyalty program that your shop offers. You want to make sure that your customers are willing to travel a little bit farther and spend a bit more effort getting to your store – instead of choosing one of your competitors. As a frozen yogurt shop owner or marketing manager, you will have to analyze your target market and determine the type of loyalty program that will work best for your business. 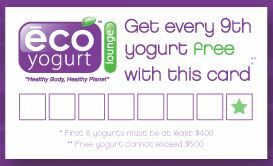 You may decide that a full punch card earns a loyal customer 10 oz of free froyo from your shop’s soft serve machine. Or, you may want to offer “flash sales,” or “BOGO sales,” for customers who follow your shop on social media and respond to your promotions within a certain number of hours. The success of your loyalty program will depend in part on the age of your customers, the location of your shop, the time of year, and several other factors that are unique to your specific shop. Even if you hand a punch card to each and every customer who comes through the door, your loyalty program will not necessarily be successful. For example, if the gift earned upon completion of a punch card is not enticing, your customers may not feel that your loyalty program is worth their effort. If you want to use your loyalty program as an effective tool to generate repeat business, increase your exposure to new customers, and develop true fans of your shop’s soft serve frozen yogurt machines, you will have to make sure your loyalty program offers something worthwhile!